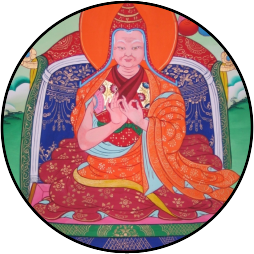 "Pema Tekchog Loden" (b.1879, d.1955) also know as Khenpo Lhagyal was the 20th Head-abbot of Dzogchen and was one of the most well-known yogis and scholars of the century. He studied and practiced under many great masters of Dzogchen including Onpo Tenzin Norbu, Dza Paltrul Rinpoche, Khenpo Shenga and Chadrel Kunga Palden. He spent most of his life in retreat and continued to give lineage transmissions, instructions and teachings to dedicated disciples who followed him. The Sixth Dzogchen Ponlop Rinpoche, Gemong Garwang Lerab Lingpa, Dzogchen Khenpo Ngaga and Khenpo Tsondru are among some of his many disciples.